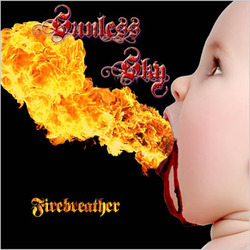 What we have with Sunless Sky is a new band featuring a mixture of veteran local Cleveland area metalheads merging together to bring forth their own brand of melodic power. This is the band's first album and I have to say that I am quite impressed with what they have done here. Disregarding the rather questionable extreme baby halitosis album artwork, once you begin to delve into the music itself, there is a lot of really choice metal to be found. First off, vocalist Juan Ricardo has a very strong vocal especially in the mid-ranged where the vast majority of the album takes place (there is not much here to show just what sort of range he has and it would be interesting in the future). He has a very biting high pitched singing style which would probably sound at home just as much in a speed or thrash metal band as it does here. Backing him up in this endeavor is the twin axe attack of Harry Hillock and Dave Kirk, which combine to give you plenty of crunchy riffs and really set the tone. With a rhythm section featuring bassist Jocko Jermann and drummer Rob Brandt, the band really seem to mesh well and write some pretty special metal. Tracks such as Deathmachine, Pandemonium, Grind You Down, Firebreather and Immortality really showcase the incredible skills that should make this band a bit more well known quickly. Then you toss in something like Human Time Bomb, which is my personal favorite song on the album and you know these guys are not just messing around here. You can also tell that their influences run the whole metal gamut from hard rock to power metal and even some thrashiness in there and that helps keep their sound from sounding old quickly. Candy's Gone Bad is the album closer and it has an actual 70's vibe (which I personally would like to see them incorporate more of into the mix to make them really stand out). I would have to say that my biggest complaint with this album is one that happens so much on a band's debut album and that is there is just too many tracks on here. Bands tend to want to include everything on their debut album and try to show it off, but after a CD gets much past ten or eleven tracks the attention span tends to wander and I think that may be an issue here. Drop off maybe two or three tracks and this could well be one of the top albums of the year in my book. But hey, at least they aren't going the easy EP route so I am not going to complain too much about it. Sunless Sky is here and prove Drew Carey was right all along....Cleveland Rocks! !